Posted by Teresa Mihelic HelpDesk on Thursday, March 15th, 2012 at 8:36pm. This is rare find. The custom home located at Avenida Calita in San Juan Capistrano has been remodeled and has potential for great ocean views! For those looking for a home free of HOA, and no mello-roos assessments, this is a gem! The home has a nice floor plan, open to the family room for that great room feel. There is a downstairs den that could be a fourth bedroom with a 3/4 bath. The spacious and private back yard is perfect for entertaining with an elevated deck and bbq area, large grass area and huge side yard. There is a pass through garage to the side yard for RV storage. Three Car garage! From the top of the yard you can see the ocean (just imagine a view deck up there!). No HOA and no Mello Roos! 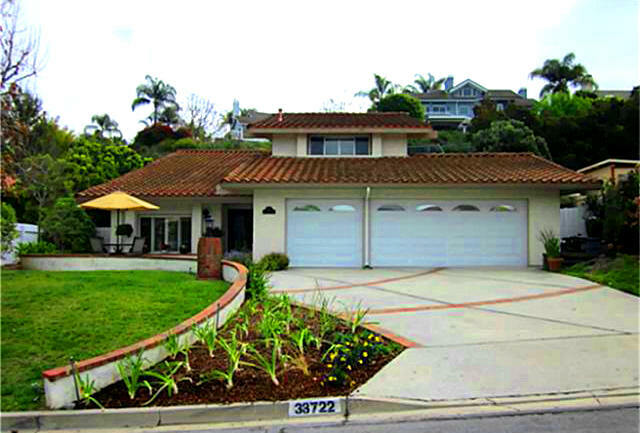 The home is close to the beach (about 5 minutes to the Dana Point Harbor), restaurants, shopping and hiking trails. Move right in and start enjoying your hidden paradise! Here's the link for more information on this home, and contact information for a showing.